Fix: Desktop Icons are outlined with a solid color (Windows XP) - TACKtech Corp. Problem: Desktop Icons are outlined with a solid color with or without drop shadows for icons labels enabled. Solution: Follow the simple steps below. 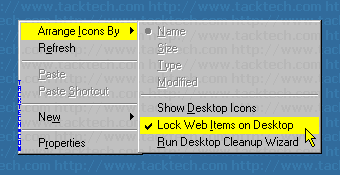 Left-Click on Arrange Icons By > Lock Web Items on Desktop. This will remove the check.